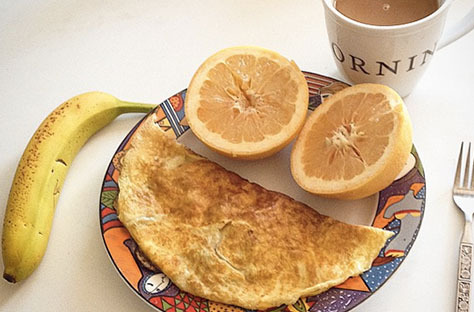 Looking for some healthy eating inspiration? 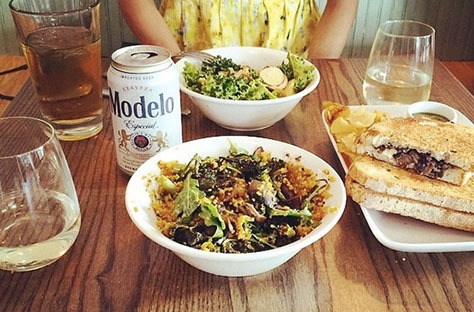 Take a peek at what's on the plates of 11 SoulCycle instructors. Forks up! One of the things I constantly battle with cooking is avoiding that ravenous feeling by the time the food is ready. The best solution I've come up with is to keep my recipes simple! Today's lunch took about 20 minutes. 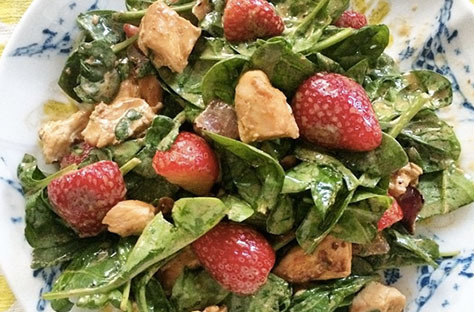 STRAWBERRY & CHICKEN SPINACH SALAD: Sauté garlic and red onions in extra virgin olive oil until they soften. Next add cubed organic chicken and cracked pepper and cook on med-high heat. While chicken is cooking through, rinse spinach, slice strawberries and add goat cheese, balsamic, and olive oil. When the chicken is ready, add to spinach and toss to finish. Serve with a tall glass of water and you're good to go. This is a super-easy one to make extra and take for lunch the next day! This is one on my favorite salads to make: It's quick, and easy, and it's healthy. 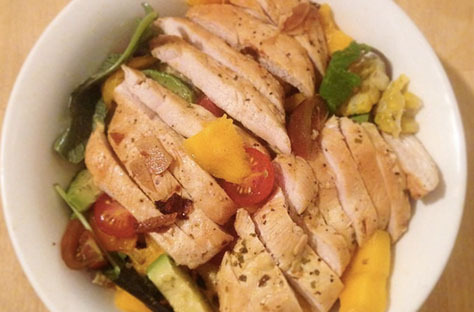 Chicken Salad: Chicken, mixed greens, cherry tomatoes, avocado, mango. You can sub crabmeat instead of chicken. On point! Sundays are my "eat whatever my body needs or craves" day. It's not about eating crappy or highly caloric meals or food with empty calories but rather more nurturing and satisfying food. So I tend to indulge in different and new places to have brunch. My lovely client and friend Nathan Urquart took me to Cookshop on 10th Avenue right after I had my knee surgery and I swear this huevos rancheros was the best meal I had in weeks! I am a consummate judge of good Mexican food since I grew up in L.A. and this great meal is perfectly tasty with spices and creamy yumminess! 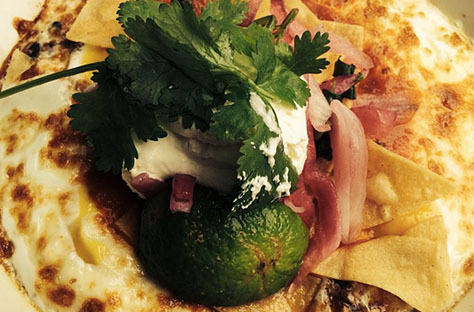 Run to this brunch one weekend for a delightful treat! I ordered this from "Saiwalks," a Vietnamese street-food style restaurant in San Francisco. 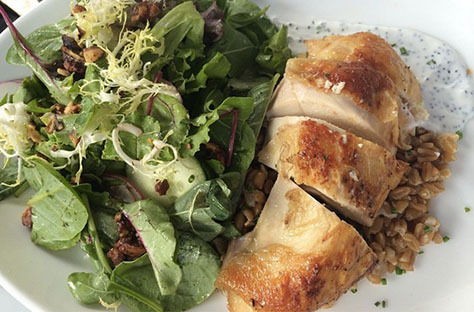 It is a great place for comfort food that is healthy and fresh. 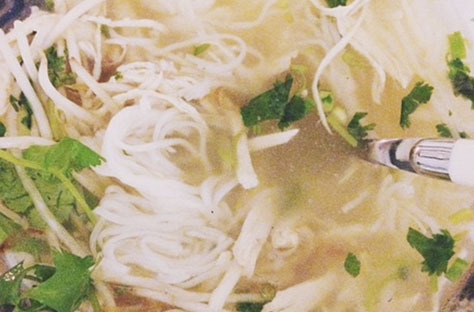 Pictured is Pho Ga, basically a chicken soup: (Homemade, slow-cooked (10-hour!) broth served steamy hot in a big bowl with rice noodles, cilantro, basil, onions, lemon wedges, and bean sprout. YUMMY! 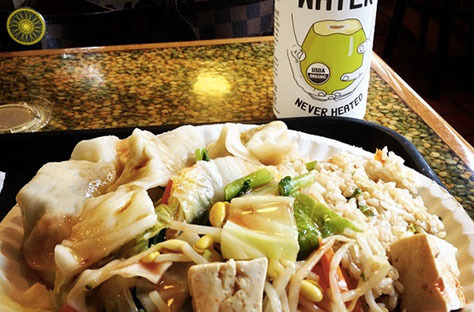 WHEAT-FREE AND MSG-FREE. I like this when I am feeling under the weather, with an upset stomach or cold. It is comforting, warm and hearty. I love Pho because it is made with herbs and you add fresh ingredients to it. Broth is nourishing and great to quickly provide your body with the vitamins, minerals, protein and amino acids! I prefer Pho Ga, for that "chicken noodle" soup remedy instead of the traditional. 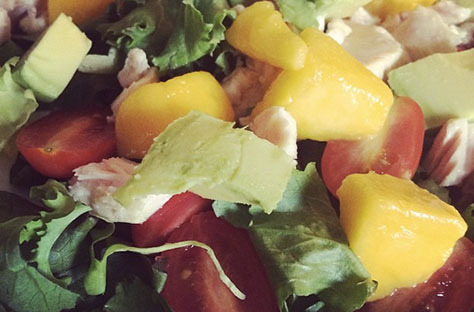 Fuel: chicken, mango, avocado, farmers market tomatoes and corn salad. I love mixing fruit and vegetables in salad. Adds a sweet surprise in every bite. My boyfriend and I made it together a month ago or so. 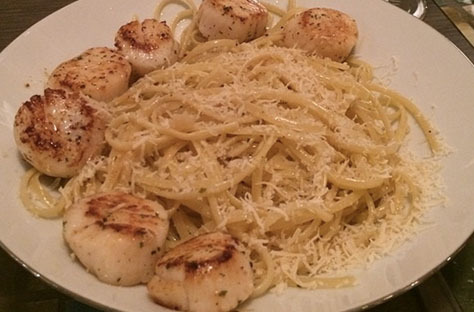 It's just scallops sauteed with a little olive oil, salt and pepper and the linguini is in garlic, olive oil, salt, and pepper — very simple but very delicious! Delicious light meal with just the right amount of spice to add a kick to your taste buds. This picture is actually at Blind Barber in Williamsburg. Often my day both starts and ends there with coffee in the morning and a glass of wine in the PM. My favorite thing on the menu is the grilled cheese! My breakfast on this particular morning consisted of an omelet with two egg yolks and three egg whites, mozzarella cheese, half of a green pepper, and black pepper inside. I also chose a banana and a whole grapefruit. I wanted to select a balance of foods that would offer me a good amount of proteins, fats, carbohydrates, and essential vitamins. And of course to get the day going, a large cup of coffee! This is like the best après-Soul fuel. I don't eat meat and like to keep my diet pretty clean so I love love love this option of brown rice, steamed veggies, veggie dumplings & tahini & hot sauce. It's from Village Yogurt which is so super close to Soul Union Square and Soul 19th Street. This is my go-to meal. 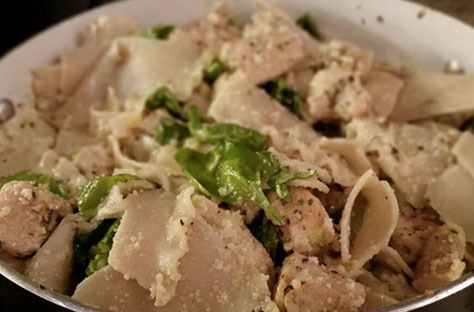 Garlic grilled chicken with spinach and basil over brown rice noodles.